Give your metal a mirror finish that ripples across the bay! 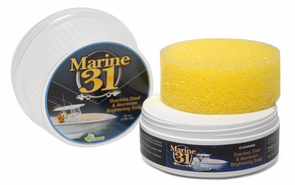 Marine 31 Stainless Steel & Aluminum Brightening Soap is the fast and easy way to polish and protect your boat's metalwork! This unique product uses a blend of natural soap flakes and silicate-free polishing clay to remove oxidation, tarnish and weathering from metal surfaces while imparting a high-gloss luster. Because Marine 31 Stainless Steel & Aluminum Brightening Soap does not rely on traditional acidic metal polishing ingredients, there is no impact on the environment. Like all Marine31 boat care products, Marine 31 Stainless Steel & Aluminum Brightening Soap is harbor-safe and effortless to use. Dull, oxidized, and pitted metal can make even the newest boats look old and neglected. The natural soaps in Marine 31 Stainless Steel & Aluminum Brightening Soap will clean away salt-spray and sticky residue. The silicate-free polishing clay will gently polish the most delicate metals, including brass and copper, to a high-gloss luster that radiates with energy as it reflects across the bay. An anti-corrosive protective agent seals the clean metal and protects against pitting and premature wear. 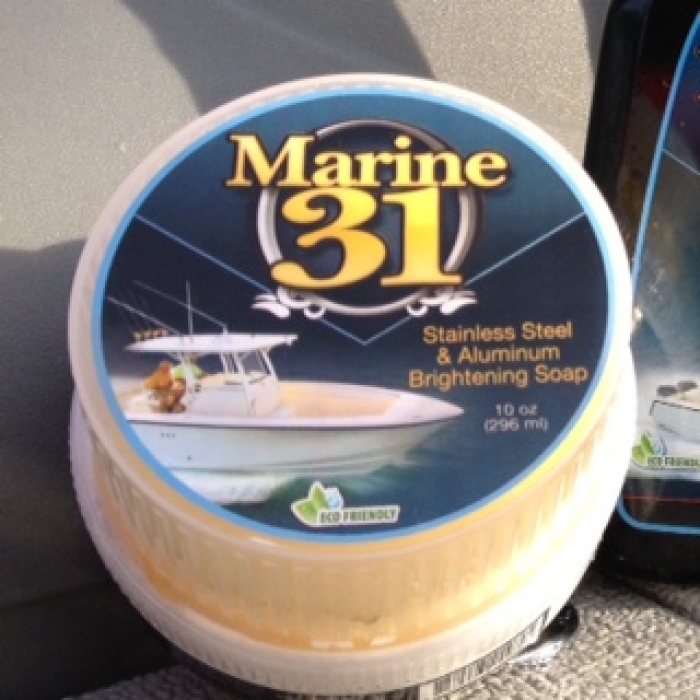 Regular use of Marine 31 Stainless Steel & Aluminum Brightening Soap will keep your metal in ship-top shape! Keeping your boat's metal gleaming used to be a chore. Not only did the metal have to be washed clean and dried carefully, but every square inch had to be painstakingly polished. With Marine 31 Stainless Steel & Aluminum Brightening Soap, you wash and polish in one easy step. Rinse away the great smelling residue and dry with a soft towel! Enjoy the sea in style with Marine 31! DO NOT USE ON PAINTED, ANODIZED OR CLEAR COATED SURFACES. Rub a damp sponge across the soap until a thick lather is created. 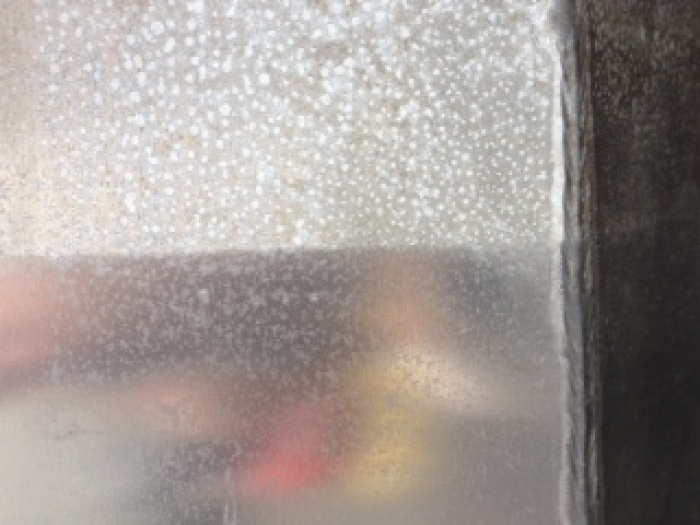 Polish the desired area until it has a mirror-finish. Rinse residue and allow sponge and soap to air dry before storing. A Word From The Captain's Chair: Use Marine 31 Stainless Steel & Aluminum Brightening Soap to wash your metal surfaces before washing the rest of your ship! This way any residual soap is rinsed away completely. 10 oz. Includes applicator sponge. 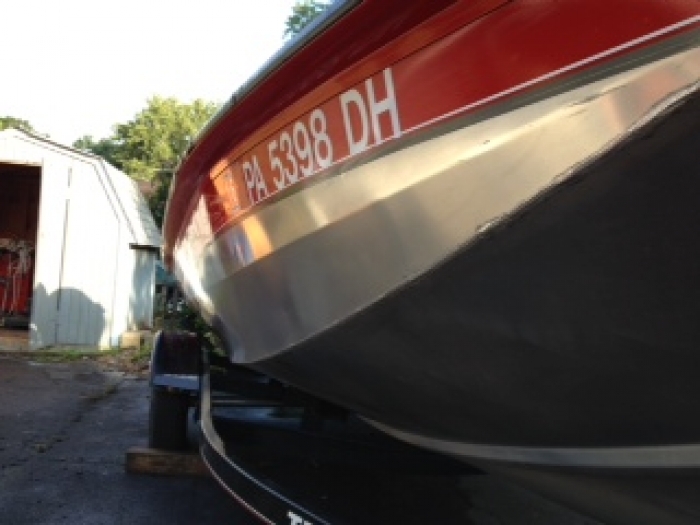 I recently used M31 Brightening Soap on a 16' Bass boat's heavily oxidized aluminum hull with fantastic results. Not owning a rotary polisher makes it hard to clean up a boat's hull, but after a few hours of elbow grease the boat turned out great. A single container was used on the whole boat w/ a little to spare. So if it's big job, like the one I had plan on getting two.